1) In a saucepan, add broth and water and bring to a simmer. begins to soften (~3 minutes), lowering heat to medium. 3) Add mushrooms and garlic, stirring and cooking for 1-2 minutes until mushrooms are soft. 4 minutes, allowing rice to toast. 5) Add wine and stir until absorbed. 6) Ladle in 1 cup of broth and add rosemary, stirring. Lower the heat to a gentle simmer. 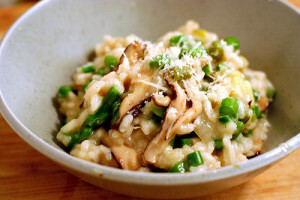 7) When cooked, the rice should be al dente and the risotto should be ﬂuid and smooth. Bring a pot of salted water to a boil. Add the pasta and cook as the label directs. Meanwhile, heat the olive oil in a large skillet over medium heat. Add the sausage and cook, breaking it up with a wooden spoon, until it begins to brown, about 3 minutes. Add the spring onions and cook until softened, about 3 more minutes. Add the garlic, mushrooms, 1/2 teaspoon salt, and pepper to taste; cook, stirring occasionally, until the mushrooms start to brown, about 3 minutes. Add the cherry tomatoes and cook until they soften slightly, about 3 more minutes. Reserve 1 cup of the pasta cooking water, then drain the pasta. Add the broth to the skillet and cook, stirring, 1 minute. Stir in the pasta and cheese, adding some of the reserved cooking water to loosen, if necessary. Season with salt and pepper. 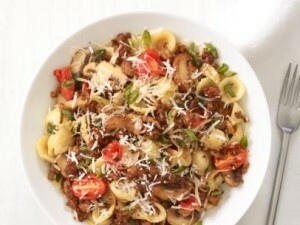 Divide among bowls, drizzle with olive oil and top with more cheese and spring onions. Seco de pollo or seco de gallina is a South American chicken stew cooked slowly in a sauce of beer, onions, garlic, peppers, tomatoes, herbs and spices. Blend the beer, quartered onions, whole garlic cloves, tomatoes, bell peppers, hot pepper, cilantro, parsley, oregano and cumin to obtain a smooth puree. In a large saucepan or soup pot heat the oil over medium heat to prepare a refrito or sofrito, add the minced red onion, minced garlic and achiote, cook for 2 minutes. Cook on low heat until the chicken is very tender and the sauce has thickened. Unless it’s ahen, the chicken should be tender in less than 1 hour. However it takes longer for the sauce to thicken, so if the chicken is very tender – meat falling of the bones – and the sauce isn’t thick yet, then remove the tender chicken pieces, turn up the heat and cook the sauce until it’s nice and thick, about 20-30 minutes. Add the remaining cilantro and parsley. Serve with arroz amarillo or yellow rice and fried ripe plantains. Can also be served withavocado slices, whole potatoes sauteed in butter and a small salad. We hope you had a great time at the OregonC city Chamber of Commerce Annual Dinner. For more recipes and great ideas for catering and bakery items please visit our website. You can now order your favorite delights right from the comfort of your desk! Just pop online about 20 minutes before you’ll walk in the door, and when you do, your order will be ready. It doesn’t get much better than that! Stay on top of menu changes and the latest cupcake offerings by signing up for our newsletter. You are now subscribed to the Sugar Street Newsletter! Every cake is custom designed for our customer!